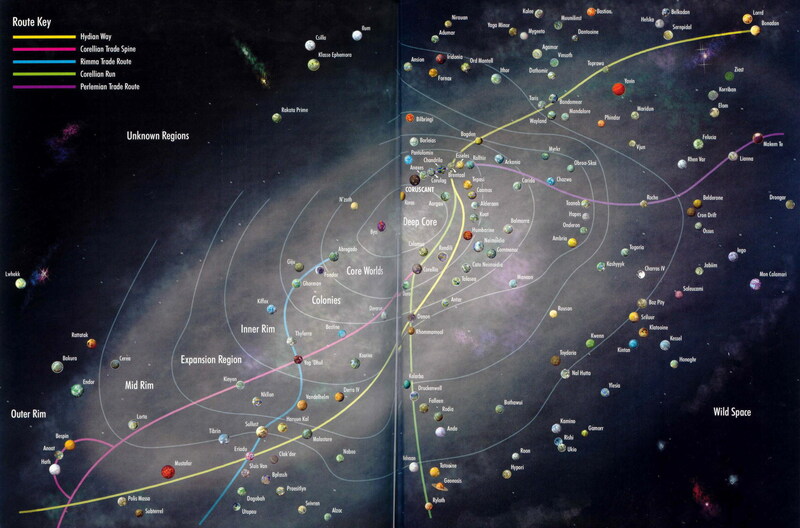 In preparation for any future sandbox style Star Wars roleplaying game campaigns, I created a list of all the star systems named in official Star Wars products, including those from the very expansive Expanded Universe, and harvested approximately two-thousand names. A drop in the bucket compared to the 400 billion stars in the Milky Way galaxy, perhaps, but still a massive volume of text for anyone to slog through. Use these star system names if you want to add some Star Wars flavor to your game and need to create the name of a new star system on the spot. Ignore the canon placement of star systems dictated by the Expanded Universe. That’s all flim-flam and you don’t need to change your Galaxy to fit the vision of some Star Wars comic book from the 80’s or wherever the canon is coming from. The only information that can really be relied on at the gaming table and have everyone on the same page is that presented in the three Star Wars movies. I also removed all of the named planets from the movies for those of us using this list in our roleplaying games to generate unknown planets. No need for me to tell you about Alderaan or Hoth, for example. Make sure to pare down the list and throw out any star systems that you think your players will be a little too familiar with; for example the Manaan System might be crossed out if an expert on the Knights of the Old Republic video games is in your Crew. Without further ado, the Grand Star Wars Star System List. This entry was posted on Friday, January 11th, 2013 at 9:01 am	and tagged with expanded universe, random tables, sandbox, Star Wars and posted in EotE Alphabet. You can follow any responses to this entry through the RSS 2.0 feed. This must have taken a while to complete. I am very glad somebody else did the work for me already, I can tell you that! Hopefully my players will take to it. You’re missing the point entirely. There is the outer rim and there are the core worlds. The subdivisions within those are irrelevant. I don’t place any stock in “canon” whatsoever outside of the three Star Wars movies and a few video games that are near and dear to my heart. Outside of that, I’ll use this list as a resource of random star system names and put them in whatever region of the galaxy that suits my story best.